Getting your book published is tough. In the UK there are many events where you can get information, but it’s harder when you don’t live in London. As a resident of York, I’m always on the look-out for good online resources. I first came across best-selling author Harry Bingham, head of Jericho Writers online members club for writers, in a webinar. One slide showed Neptune with the caption “Planet Publishing revolves four times slower than Planet Earth.” His humour, and obvious experience, made it incredibly constructive. When the chance came up to exchange annual membership by supplying a Jericho Writers review, I jumped at it. My day job is being freelance copywriter and content writer for websites. I’ve managed websites since 1997. So my review isn’t just from an author perspective. The Library section is crammed with excellent articles. Bludgeoned by the experience of submitting to agents, I was immediately drawn to ‘How to deal with rejection as a writer’. I lapped up quotes like “Rejection can feel like a sucker punch to the stomach” and advice such as “Keep up writing for the joy of it”. It’s good to know I’m not the only one. You can waste a lot of time scouring the internet for answers to questions such as “How long is a book of adult fiction?” Here you get the answer – 70,000 to 120,000 words if you’re wondering. Plus a breakdown by genre, although historical fiction was missing. It’s good to know that Book 1 is hitting the average of 90,000 words. If you’ve always longed for a Writing Channel on TV, your prayers are answered! 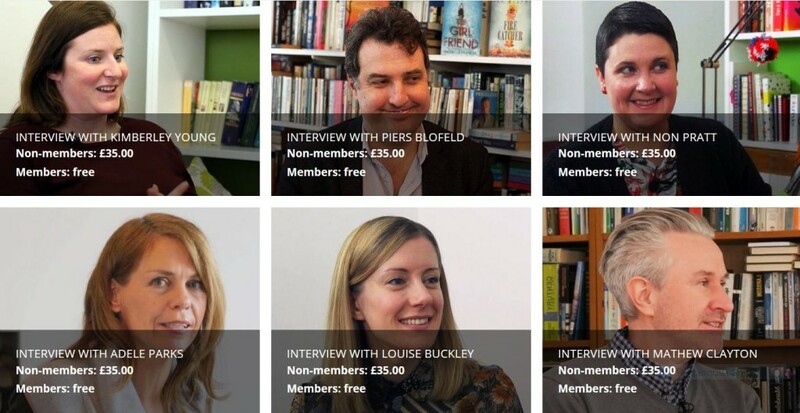 The Cinema section is packed with in-depth hour-long interviews with agents and authors. There are also shorter snippets, webinars and advice sessions on ‘Writing an unlikeable character’, ‘Is your idea any good?’ and ‘Plots and premises’. Some improvements would be to offer captions for the hard of hearing. There needs to be a noun added after the person such as ‘Charlotte Bronte, author’. A description under each video such as ‘Charlotte is a successful author from Yorkshire who has sold 30 billion copies of her romances’ would help give context. A few more diverse interviewees would be welcome. There’s a certain whiff of ‘white privilege’ at the moment. Agentmatch Search is brilliant! I’ve used other online databases before. 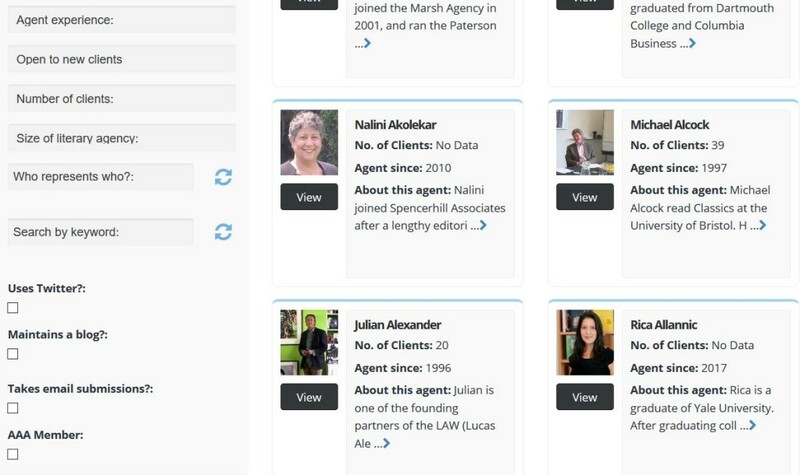 But here there are links to online articles by that agent. It’s akin to being at some publishing drinks party when you read comments such as “the truth is many writers will find easier doors to knock on” and “we would suggest you be wary”. Being able to filter by genre, country and whether they’re a member of the Association of Authors’ Agents is great. There are also filters of ‘not accepting submissions’, ‘keen to build list’ and ‘open to new authors’. Combining the last two into an extra option of just ‘Keen or open’ would be even better. Or what about letting us choose more than one option? The downloadable Worksheets are exceptionally useful and appealed to the class swot in me. However to save trees, it would have been good to put the advice at the front and then the boxes at the back. The Plotting Superstar Worksheets could be improved by having larger boxes to write in. Although I might be a bit old-fashioned in thinking the pen is mightier than the keyboard. There are a few technical glitches. The videos buffer an awful lot. I swore I changed my password, but it didn’t stick. I felt like I was stuck in the stairwell scene in Labyrinth trying to get into the Town House forum area which kept asking me to Login. However clearing cookies and the classic “turn it off and turn it on again” sorted it. Like most users would, I headed to the top-level navigation. However this seemed pretty sparse. It turns out that some absolute gems are in the footer navigation, such as Cinema. I would suggest Jericho Writers add these to the Library section. It gives the impression of being a little slap-dash, which isn’t good when people have paid money to access the information. Someone offering to look at your query letter? For free? This is gold dust. I felt like I stumbled across this, so it would be good to promote this in the navigation. Or even have a ‘free to members’ section? Jericho Writers review summary – is it worth joining? I view my novel writing as a second job that hasn’t – as yet – paid me a penny. So an annual membership of £195 seems steep. It’s a snip though if you see it as an alternative to attending their Festival of Writing, which was £575 last year. To put this in context, the excellent weekend Historical Novel Society Conference was £100. With two nights’ bed and board it was £370 in total. So maybe Jericho Writers’ target audience is more affluent than other writing communities? The Cinema section and Agent Search are what really elevate Jericho Writers from other online resources. If you treat it like an intensive writing course, there is a more ‘starving author in a garret’-friendly option of £30 a month. Maybe you could ask Santa for a month’s worth or two and make sure you focus? It’s what I would have done if I hadn’t received annual membership in exchange for this review. Right, back to the Snowflake method of plotting and checking out videos of potential agents. Thank you Jericho Writers for re-invigorating my enthusiasm for finding an agent and getting on with Book 2! Tip: if you join their email newsletter offer, there are sometimes 7 Day free passes and links through to certain sections.